Author(s): Yasuhisa Yamamura. Department of Chemistry, Faculty of Pure and Applied Sciences, University of Tsukuba, Tsukuba, Ibaraki 305-8571, Japan. 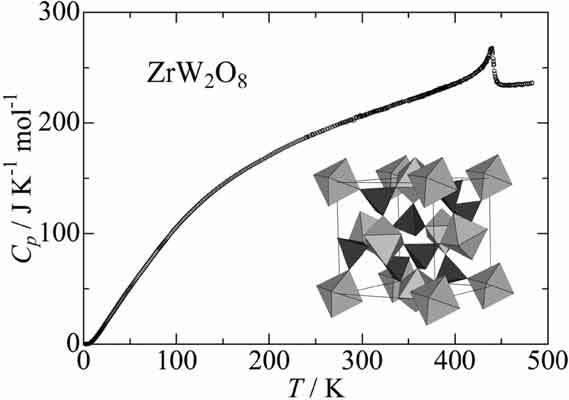 In this paper, various thermodynamic approaches to the structural phase transitions and the phonon properties of the materials showing negative thermal expansion (NTE) in the wide temperature range are briefly reviewed through three families of the NTE compounds; ZrW2O8, ZrV2O7, A2B3O12 (A = trivalent cation, B = W or Mo) families. As for the structural phase transitions, the thermodynamic approaches provide us with elucidation of their mechanism from an entropic point of view. The NTE is closely related to phonon properties. Heat capacity measured by calorimetry enables us to estimate not only a Grüneisen function but also a distribution of phonon density of states, leading to specifying the phonon modes with negative mode-Grüneisen parameters. It is demonstrated that the thermodynamic approach is powerful to research the properties of the NTE materials. Keywords: Entropy of transition, framework structure, Grüneisen function, heat capacity, mode-Grüneisen parameter, negative thermal expansion, order-disorder phase transition, phonon, structural phase transition, thermal expansion, ZrW2O8. Affiliation:Department of Chemistry, Faculty of Pure and Applied Sciences, University of Tsukuba, Tsukuba, Ibaraki 305-8571, Japan. Keywords:Entropy of transition, framework structure, Grüneisen function, heat capacity, mode-Grüneisen parameter, negative thermal expansion, order-disorder phase transition, phonon, structural phase transition, thermal expansion, ZrW2O8. Abstract:In this paper, various thermodynamic approaches to the structural phase transitions and the phonon properties of the materials showing negative thermal expansion (NTE) in the wide temperature range are briefly reviewed through three families of the NTE compounds; ZrW2O8, ZrV2O7, A2B3O12 (A = trivalent cation, B = W or Mo) families. As for the structural phase transitions, the thermodynamic approaches provide us with elucidation of their mechanism from an entropic point of view. The NTE is closely related to phonon properties. Heat capacity measured by calorimetry enables us to estimate not only a Grüneisen function but also a distribution of phonon density of states, leading to specifying the phonon modes with negative mode-Grüneisen parameters. It is demonstrated that the thermodynamic approach is powerful to research the properties of the NTE materials.